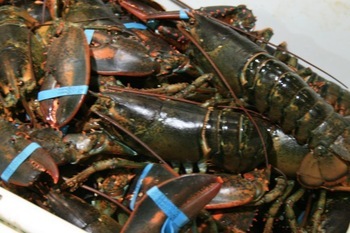 Canadian live lobster exporters expect to see the elimination of the 8% EU tariff on live lobsters this month, as a result of the implementation of the Canada Europe Trade Agreement (CETA). The agreement has various provisions lowering tariffs on Canadian seafood exported to the EU over several years, but the 8% tariff on live lobster is scheduled to be eliminated completely the day the pact goes into force. This has the potential to disrupt live lobster trading patterns during the important Christmas holiday season. At this time, most of the lobster shipped overseas is Nova Scotia hard shell lobsters, from fishing areas 33 and 34 which represent the largest Canadian lobster production areas. LFA 34 opens generally the last Sunday in November, until May 30th. The bulk of the catches are generally in the first month. Much of the export of live lobster to Europe moves through Boston..